The Veterinary Medicines Directorate (VMD) is the Government agency that regulates medicines for animals (‘veterinary medicines’). We ensure medicines are safe and effective by authorising medicines that protect your pet’s health. A medicine can only be sold in the UK if it is authorised by the VMD following an assessment of its benefits and risks. You can check if an animal medicine is authorised using the VMD’s Product Information Database. This is a searchable database of definitive, up-to-date information about all UK authorised veterinary medicines (i.e. what they contain, what they do and any specific warnings to consider when using them). HOW DO I USE A VETERINARY MEDICINE SAFELY? When giving a medicine to your pet, follow the instructions on the label and the instructions given to you by your vet or the person who supplied the medicine to you. To ensure their safety and effectiveness, medicines must be used in accordance with the label instructions, which have been checked and approved by the VMD. Antibiotics are the only effective treatment for some animal diseases and are essential for animals’ health and welfare. Any exposure to antibiotics increases the risk of resistance to antibiotics developing. We must therefore use them responsibly. 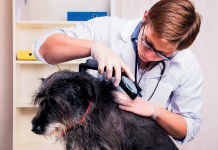 Trust your vet and their advice on whether your pet needs antibiotics. Ask for information at your vet’s surgery (posters, leaflets etc) about using antibiotics responsibly. WHAT DO I DO IF THERE ARE SIDE EFFECTS FROM THE MEDICINE? 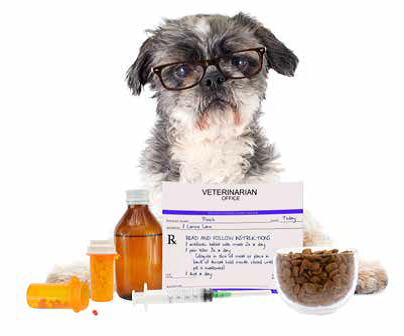 Harmful side effects to veterinary medicines are rare. If your pet has a reaction to a medicine, tell your vet who will advise you if your animal needs further treatment. The VMD wants to know about such cases too. Either you or your vet can report such cases to the manufacturer or to us online. Companies that market veterinary medicines are required by law to report to the VMD any side effects they are told about. You can also notify the VMD online if the medicine hasn’t worked. 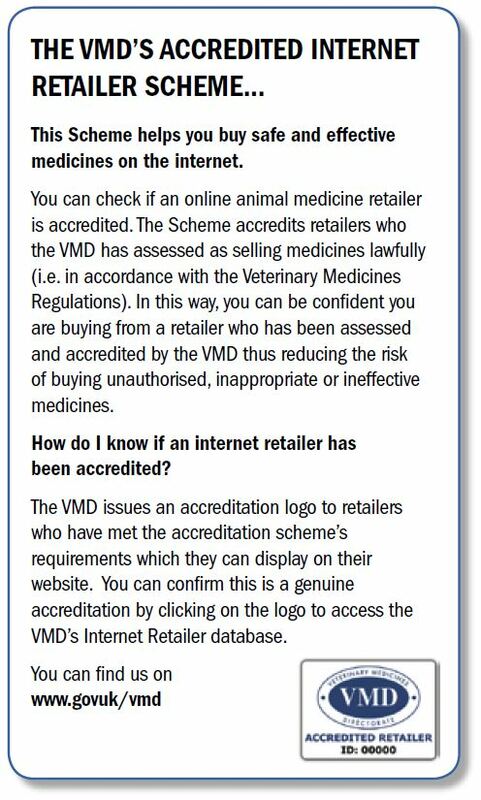 The VMD will use the information you provide to ensure veterinary medicines are used safely and effectively (e.g. by placing additional warnings on labelling if required). CAN I BUY MEDICINES FOR MY PET ON THE INTERNET? Yes. The selling of veterinary medicines on the internet must comply with the law – the Veterinary Medicines Regulations. If the medicine you wish to buy requires a prescription, all reputable websites will ask you for one which your vet can give you. If an internet retailer offers to sell you a prescription medicine without asking to see your prescription, the sale will be illegal and you may also have committed an offence by buying the medicine without a prescription. Medicines labelled as NFA-VPS (e.g. a type of wormer) do not need a prescription but should be accompanied by advice. 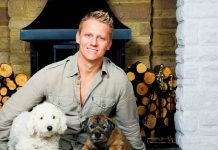 You may therefore be asked some questions about your pet (its weight, age etc) before purchase. Medicines labelled as AVM-GSL and medicines labelled as covered by the ‘exemptions for small pet animals’ can be bought and sold on the internet without any restrictions. WHAT SHOULD I BE DOING ABOUT MY PET’S VACCINATIONS AND BLOOD TESTS IF WE’RE ABOUT TO TRAVEL? To ensure your pet can travel from the UK to the EU after 29 March 2019, you should contact your vet at least four months before travelling. See GOV.UK for the latest advice. My dog has bald patches, could it have mange?